Fourth-grader Cole McNicholas (right) emerged as the top collector with $1,010 raised for Maternity B.V.M. School’s Trek for Tech fundraiser held April 12. 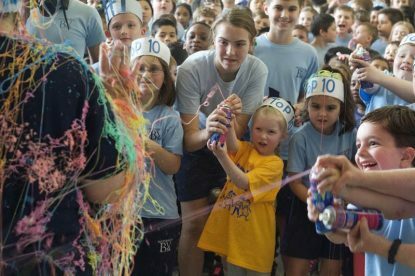 One Catholic school in Northeast Philadelphia is marching into the future of educational technology — full “STEAM” (science, technology, education, art and math) ahead. More than 500 students at Maternity B.V.M. 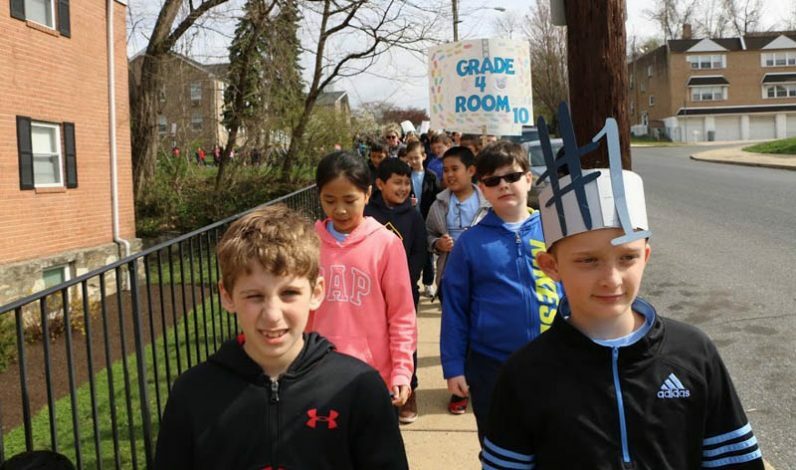 School in the city’s Bustleton section paraded around their campus on April 12 in a “Trek for Tech.” Now in its third year, the annual walk-a-thon capped a fundraising initiative that raised over $33,000, exceeding its $20,000 goal by 50%. The monies will be used to purchase smartboards, Chromebook computers, a 3D printer and additional equipment for the school’s STEAM curriculum. “Our objective is to upgrade our technology every year,” said principal Mary Zawisza. After coming up about $8,000 short of 2018’s goal, Zawisza and advancement director Michael McDonough decided to use a more tech-savvy approach for this year’s effort. Rather than relying on traditional sign-up sheets and door-to-door solicitations, they tapped Independent Fund Raisers, a Lansdale-based firm that specializes in highly localized development campaigns. Students have fun dousing principal Mary Zawisza with aerosol Silly String during the Trek for Tech festivities April 12. Working with the firm, Zawisza and McDonough created webpages for each student, through which family and friends submitted online contributions and tracked the individual amounts raised. Because the webpages could be easily shared across social media platforms, the campaign reached a broader audience while generating friendly competition between families and classmates. Spurred on by a $500 donation to a classmate, fourth-grader Cole McNicholas emerged as the campaign’s top collector, raising $1,010. Zawisza — who submitted to being sprayed by 24 cans of aerosol string as part of the April 12 celebration — said the online approach was safer and more effective. Using social media and other modern communications technology is central to the school’s educational mission, said Zawisza and McDonough. The school is also expanding its in-house media studio, which currently produces Panther Pride News, a five-minute weekly news broadcast which can be accessed through the school’s website. Rotating crews of students research, write and film the segments, with an eye to creating daily news announcements thanks to a growing collaboration with Father Judge High School. The students are also set to begin work on a series of five-minute documentaries that will highlight various decades in Maternity B.V.M. Parish’s 150-year history. The school community celebrates the end of the walk April 12. NEXT: What do you remember about the Cathedral of Notre Dame?